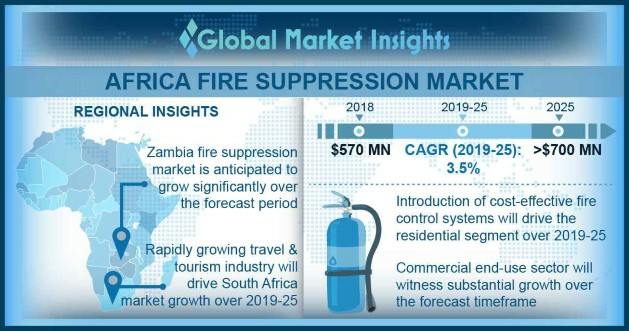 Africa Fire Suppression Market size will surpass USD 700 million by 2025, as reported in the latest study by Global Market Insights, Inc.
Interminable need for fire protection and rapidly expanding industries are the key factors driving the Africa fire suppression market growth. Proliferating equipment market along with emerging service sector have instigated huge demand across the sector. Growing deployment across industries owing to presence of highly flammable product including oil & gas, chemicals, raw material involved in manufacturing and mining will enhance the industry outlook.